Refer Your Friends to Dash! Dasher milestones are designed to reward a Dasher for making a minimum number of deliveries within a given time-frame. Dasher milestones will usually have a location requirement as well. Below are some common questions we receive about milestones that we hope will help you understand them. How do I receive a milestone? Milestones in Northern California are sent out via text message. They offer extra pay in areas where we think we will need more Dashers at times when we think we will need them. How do I interpret the milestone messages I receive? We have received questions like this a lot, so have a few examples below of common milestones a Dasher could receive. WHAT TIME: 4:30pm - 8pm. This time applies to each day. So this means only deliveries you accept between 4:30pm - 8pm Monday, 4:30pm - 8pm Tuesday, etc. will count towards the milestone's minimum required deliveries. MINIMUM REQUIRED DELIVERIES: There are 2 minimum requirements. The first is 7, and the is 15. That means you get money if you make 7 deliveries, and you get more money if you make 15 deliveries. PAYOUT: There are 2 payout amounts, $15 and $15, and they correspond with the minimum required deliveries. If you make 7 deliveries, you get $15. If you make 15 deliveries, you get an extra $15 for a total of $30. 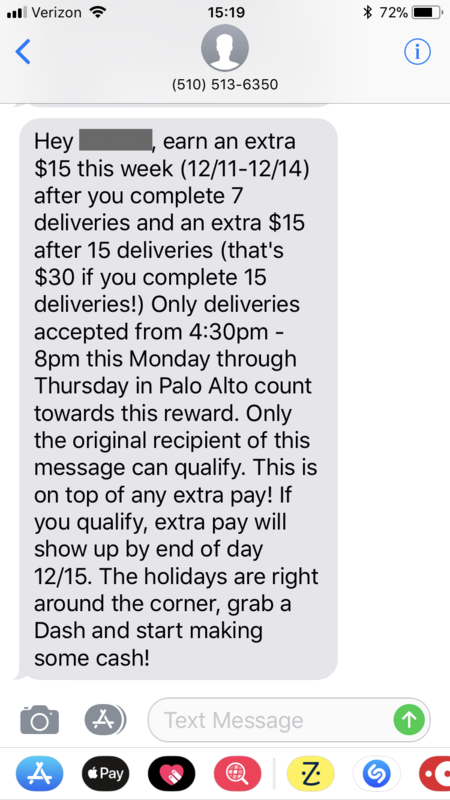 WHEN WILL I GET PAID: This message says extra pay will show up by end of day 12/15. WHAT TIME: No specific hours are mentioned in the message, only dates, so you can Dash any time on 1/12 - 1/14. MINIMUM REQUIRED DELIVERIES: 10 deliveries a day. PAYOUT: $50 a day if you make 10 deliveries. Since the milestone runs for 3 days, and you can earn $50 a day, you can earn up to $150 for this milestone. 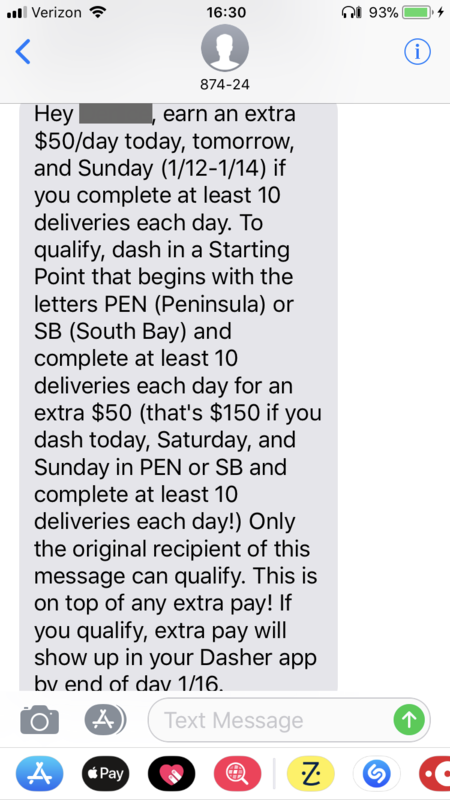 WHEN WILL I GET PAID: This message says extra pay will show up by end of day 1/16. Why hasn't my extra milestone pay shown up in my Dasher app yet? Milestone payouts are calculated separately from delivery pay and therefore may take additional time to process. This is why the milestone message includes a date on which the extra pay should show up. We apologize for any delay there may be in processing your payment. If it is past the date that milestone message says your extra pay should be in your Dasher account, and you wish to contact support for more information, please include a screenshot of the milestone message for reference. Some milestones have an acceptance rate requirement of 75%. How does that work? Some milestones will have stricter requirements. Keeping your acceptance rate at or above 75% for the duration of the milestones is one of them. Your acceptance rate for the duration of the milestone is calculated by taking all of the deliveries you accept from the time the milestone is in effect divided by all the delivery opportunities you received for the time the milestone is in effect. For the 12/11-12/14 example, if it had an acceptance rate requirement, your acceptance rate for that milestone would be calculated by looking at all the deliveries you accepted from 4:30pm - 8pm every day between 12/11 and 12/14 and dividing that by the number of delivery opportunities you received from 4:30pm - 8pm every day between 12/11 and 12/14.